"In studying social media we must also embrace social sciences. 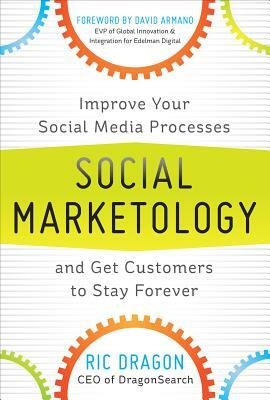 Sociology, psychology, neuroscience, statistical analysis, ethnography, as well as marketing are at the source of Social Marketology, and Dragon explains how and why it matters to business." "There is no longer any doubt that social media is one of the key digital trends that are reshaping today's industries, brands, and customer networks. Ric Dragon's immensely practical guide will help you get the most out of your own social media investment by identifying the processes and best practices that build real and valuable business relationships. Read it, and use it, today "
"If you think Facebook, Twitter, and the like are simply trends or fads, you're missing the bigger picture. Consumers are more connected than ever before, and they are highly untethered (thanks to smartphones and tablets). Now that we're past the whole 'Do I really need social media for my business?' Ric is here with Social Marketology, a smart look at how to get social media organized for your business." What has not been established are the best practices for creating the most ideal social media strategy for your particular needs--and that's where this book comes in. In Social Marketology, cofounder Ric Dragon of the renowned search engine marketing firm DragonSearch, takes social media marketing to the next step--showing how to choose the best tools for your needs and develop a strategy tailored to your goals. Ric Dragon has more than 16 years of experience in online marketing and software development. He is cofounder of the software and web development company Oxclove Workshop, where he was instrumental in business process analysis, information architecture, and process improvement. Dragon is the cofounder and CEO of DragonSearch, where he has led social media strategy for Steuben, the Grammy Foundation, Raritan, and other organizations.